Why are you blowing your coat in November??? Kody after his grooming....no, that is not snow! 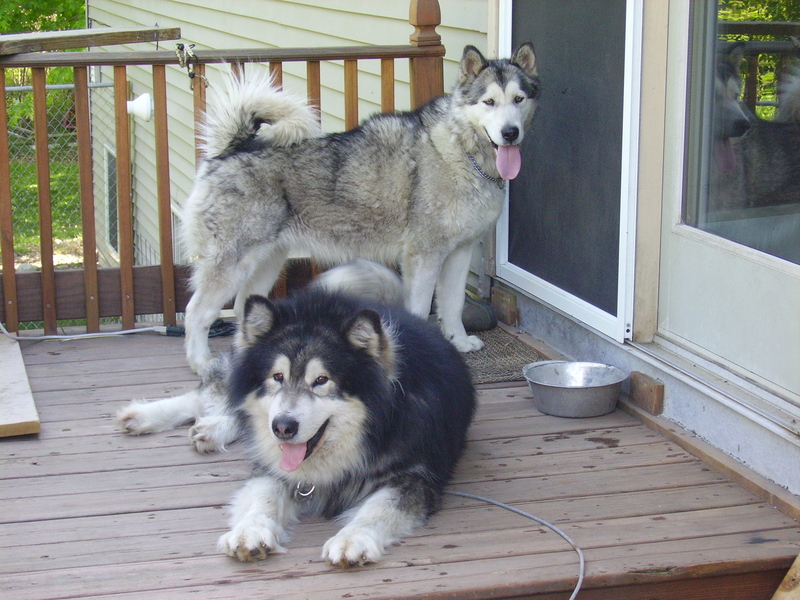 Kody (front) and Jessie (back) hanging out on the deck! 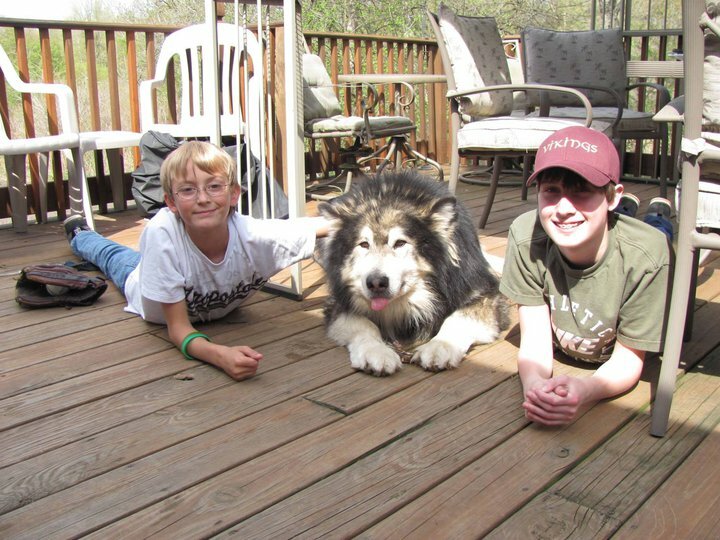 At "Nature Bounty" we are a family raising beautiful Alaskan Malamutes. We are NOT a "puppy mill". Our dogs are part of our family - not "breeding stock". At Nature Bounty, we pride ourselves on raising quality mals for families who share our love for the breed. We breed for AKC quality standards as well as temperments. Our puppies will be available to go to their new homes at 8 weeks of age, and will be vet checked and current on first shots and deworming. Both sire and dam are available for inspection. Our mals are OFA (hips)- good and current on CERF (eyes). Sire and dam have championship lines and are currently working towards their titles. For the puppies best interest, we perfer not to ship, but may under special circumstances. Our puppies are NEVER sold to pet stores/brokers/dealers. We will talk to all potential puppy owners to get to know them. A puppy will not be given to anyone that we feel would not be totally committed to the puppy's well being. We expect to continue a relationship with all puppy owners for years to come. We are dedicated to our puppies for their entire life. Your new "baby" will come with AKC registration papers, first shots, vet check, dewormed, copy of pedigree, and pre-spoiled! Kody takes First Place!!! - Okay, he was the only one in his class! KODY,"I THINK MY STUFFINGS ARE FALLING OUT!" We will ship puppies to only the lower 48 US states. Contact your local airline for information. You must arrange and pay for shipping the puppy. We will deliver the puppy ready to fly from Lansing's Capital City Airport. You will also need to add $50 for the crate and $50 for the health certificate (required). The cost of flying a pup is around $250. The puppy must be atleast 8 weeks old to fly! 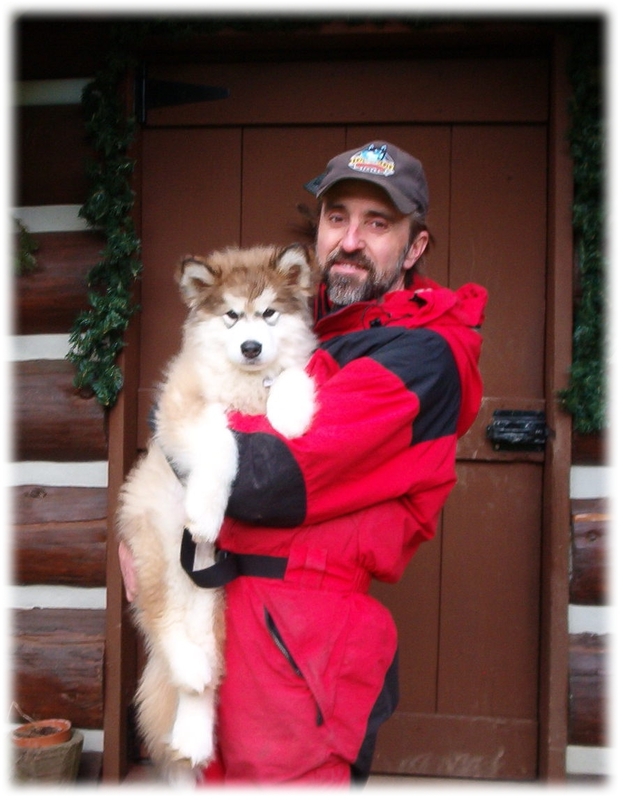 At Nature Bounty we believe in raising our malamutes the "natural" way. We feed our dogs top quality raw foods like: beef, pork, chicken, fish, and venison (BARF - see links below). We are currently beginning our dogs with dog sledding which provides our dogs with their natural desire to pull. They learn fast and our children love being pulled around our yard. 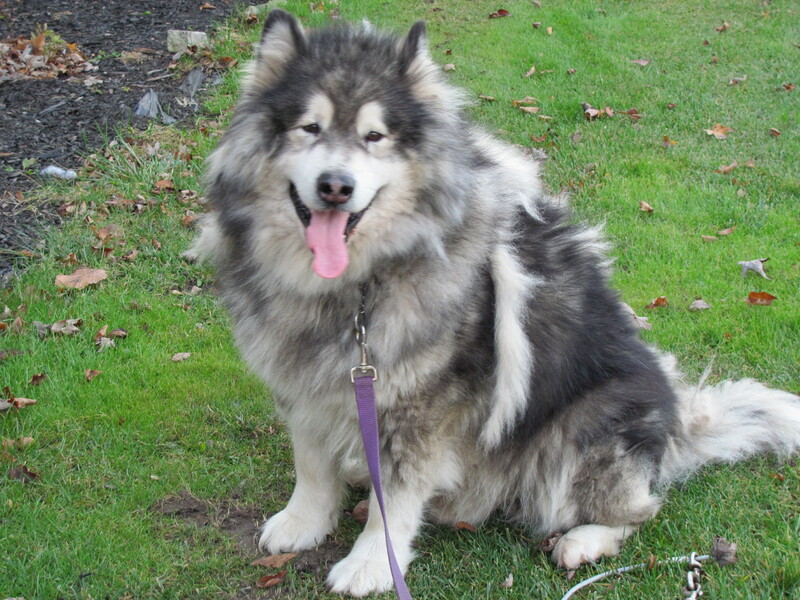 The Alaskan Malamute is a beautiful dog. 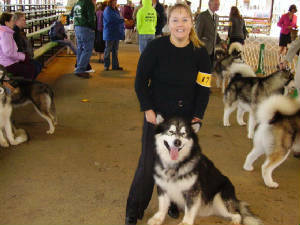 Our dogs will average 85-125 pounds, and will reach standard AKC height. 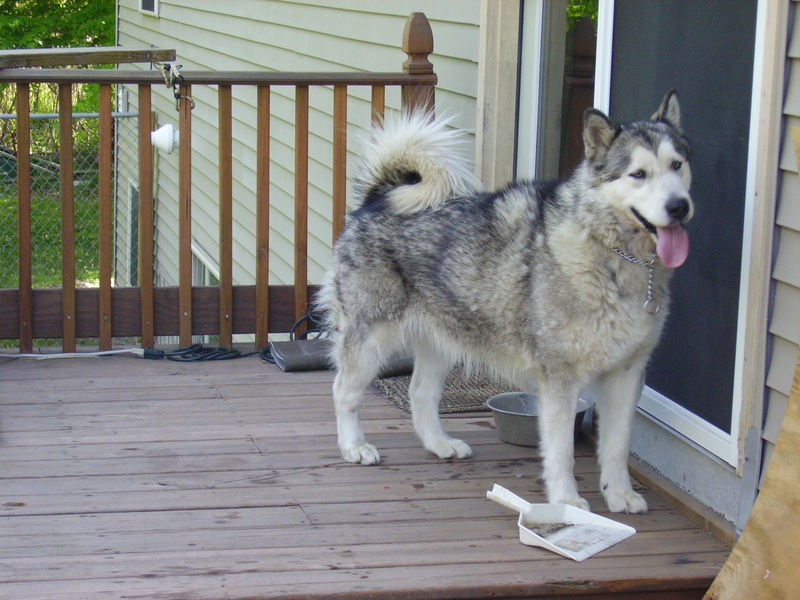 A malamute is a breed that needs exercise and human attention. They love to dig, chase other animals, and run. 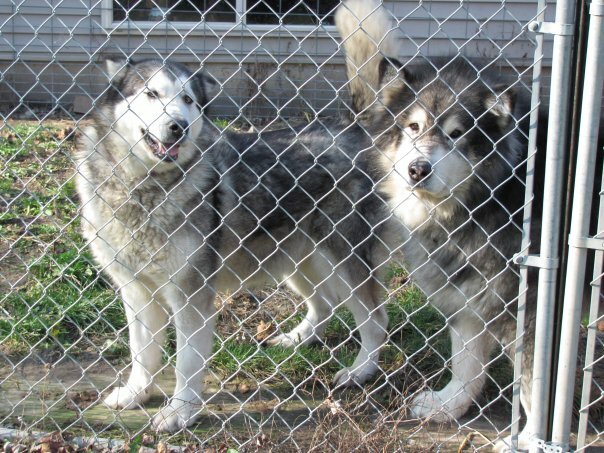 Without a proper fence, a malamute will run away. 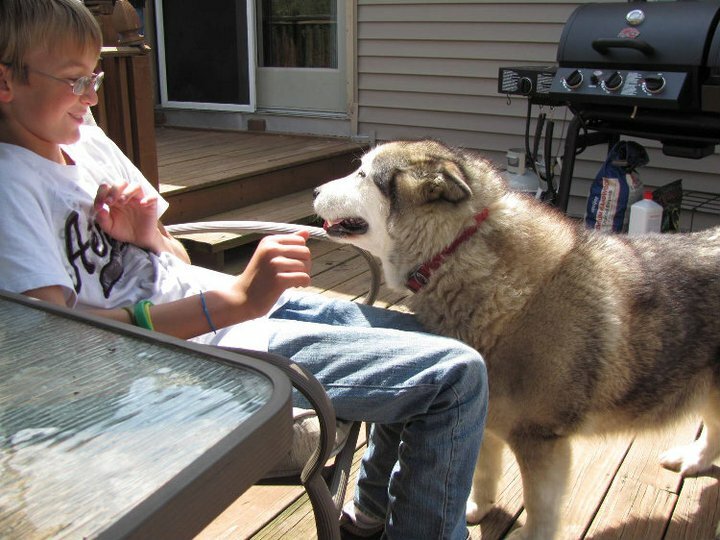 A malamute's coat also needs much attention. 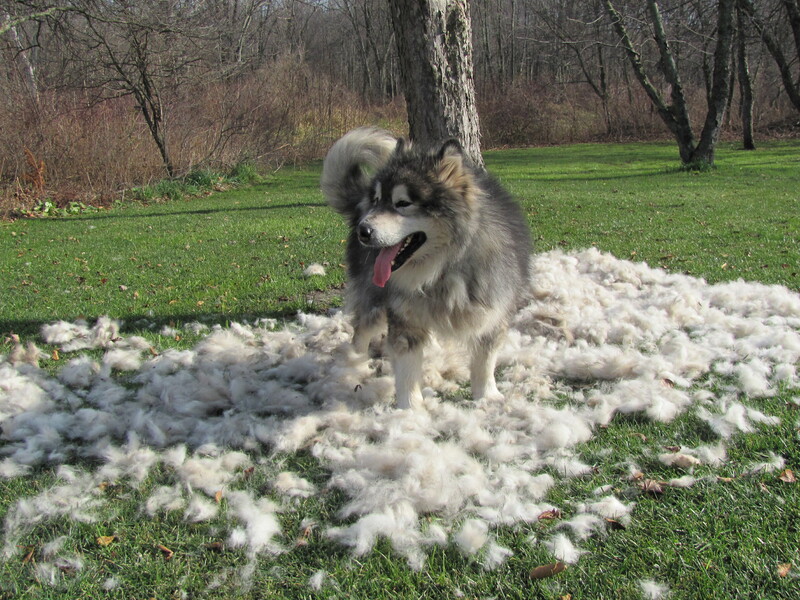 Expect to groom their coat often and they will also "blow" their coats at least twice a year. Our puppies will go to only approved homes. New owners must sign a contract and understand the breed. A strong fence system is a must along with a lifetime dedication. Feed a dog raw food? Yep! Visit pets4life.com for more info. Puppysites.com The Dog Lovers online directory! 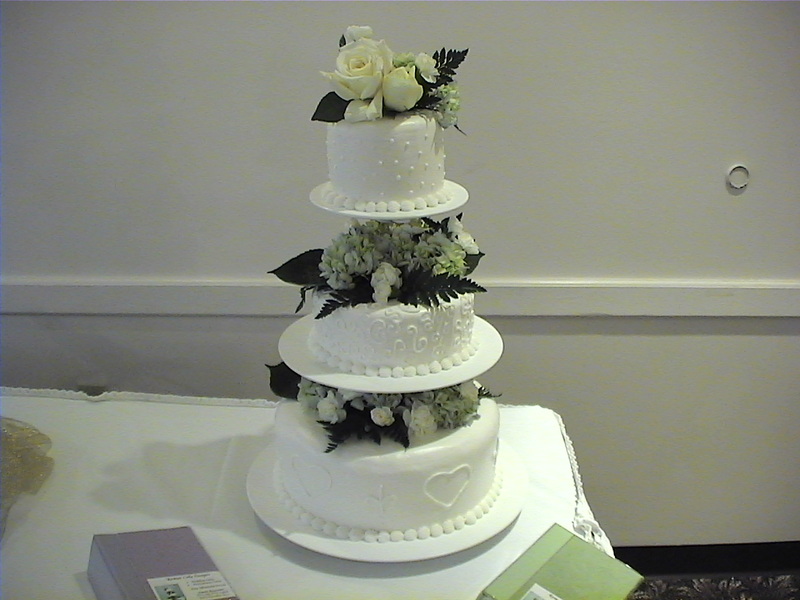 All occasion cakes in the Lansing area - great prices! Sorry - We have no puppies available at this time! Need a Stud? Click here for (Stud Dog Central)!!! Actually, Kody is pulling the sled AND Destiny! Click on picture to visit "Call of the Wild Huskies. com"
Kody after having a snow ball fight. Our first snowfall of 5 inches. Our cats are also "outside" animals. They have a "cat" house under the deck and in the really cold winter days, they hang out in our garage. They get plenty of love and enjoy the great outdoors hunting and climbing our trees (and being chased by the dogs). A big "thank you" to Dave and Lori Tomlinson, Scott Marier, Jan Johnson, and Paula St.Andrew for donating tons of meat for the dogs! Meat donations are always welcome!! Keep the carp coming - Sgt. Pope!